The weather has been really miserable and gloomy, so in keeping with this pathetic fallacy I decided the darker concept should reflect in today’s look, but in a glamorous way. I’ve always been fascinated by Dark Glamour, to be able to portray beauty against all odds in its own mysterious way, which is as interesting as it is truly beautiful. 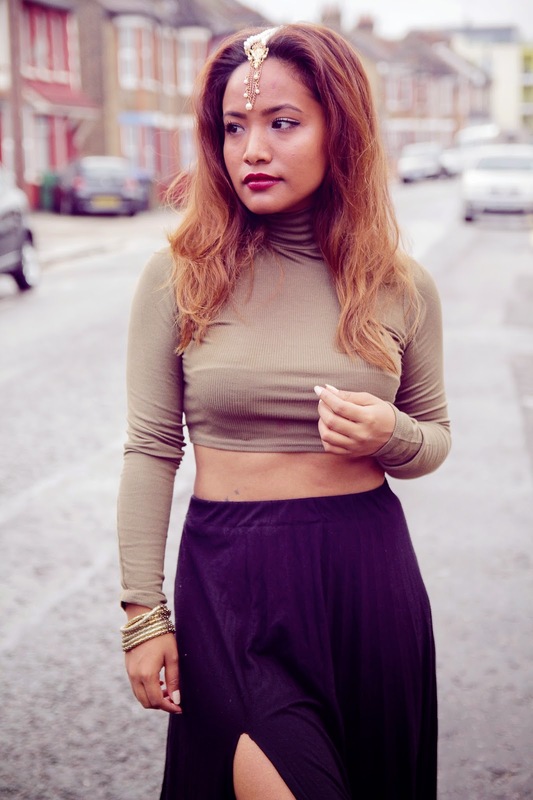 For my look today I wore this khaki high neck crop top with one of my favourite maxi skirts. The fun part about this skirt is that it has two slits at the front, which I added myself, and yes I bared the cold showing legs to emphasize the slits. These also accentuate that dark sultry feel to the look. I am wearing my new favourite shoes, which are the most comfy shoes ever. I love wearing dark lips in winter, so I kept the make up darker and added a headpiece to exaggerate the glamorous touch. I hope you like the look. Hi beautiful. I adore you and your lookbook looks pretty awesome! Keep posting and would love to come back for more. awww thank you so much darling for such sweet comment. I am glad you liked the looks.